Long a staple of the live classroom, discussions have also found a central place in online classes. While asynchronous and synchronous software allows a variety of interactions, the fundamental questions of organizing good discussions remain. Should the priority be put on content, skill development, or both? How can students be encouraged to engage in critical thinking when responding to discussions? How can the development of skills be assessed? 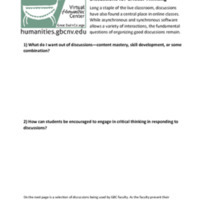 The items below represent some of the discussion-oriented items located in the VHC's Humanities Toolkit. On 21 January 2016, the VHC hosted an open forum on using discussions to encourage critical thinking skills, especially those associated with the Humanities Core Skills which the VHC seeks to promote. The pdf handout distributed at the workshop (to left) provides a series of questions instructors should consider when using discussions, and example discussions from GBC faculty presenters Scott Gavorsky, Kathy Schwandt, and Joshua Webster. 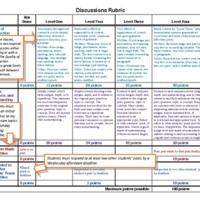 Below are some sample discussion rubrics which can be used to help students learn to structure discussion posts and responses. One of the more difficult problems with using discussions is leading students to complete discussions in such a way to cover the material properly and be assessed easily. This difficulty is especially troublesome when discussion questions vary in style over the course of a semester, preventing the use of a single formulaic response format. 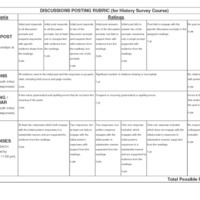 For my History survey courses, where the discussions are designed to address both course content and skills in using evidence, I use a standard set of discussion requirements. The requirements cover what is expected of students in responding to questions, including a brief discussion of source material types and examples of proper citation to be used in the discussions. Also included is a rubric for use with these requirements. 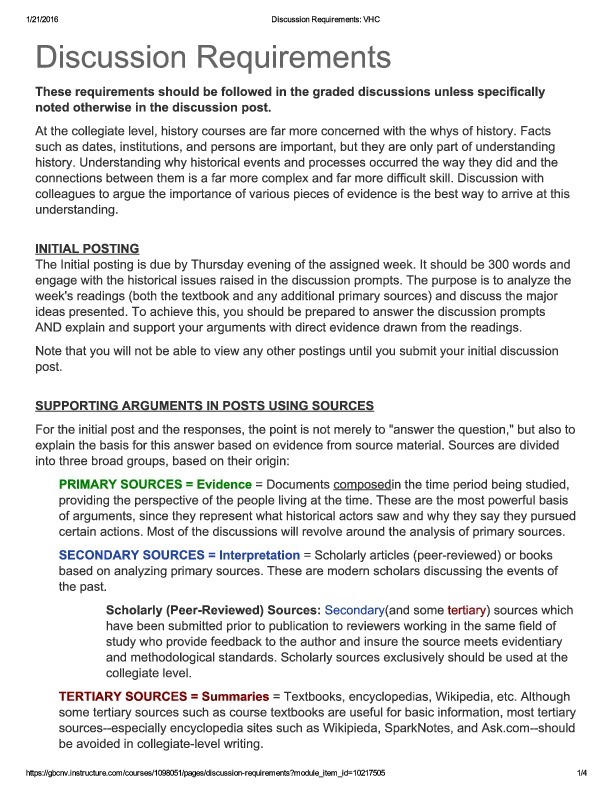 I set up my discussions based on three prompts each week, which provides a simple format for grading the content of the initial post and the use of evidence. Technical proficiency is also assessed by a small number of points for proper citations and spelling/grammar. Finally, two responses to colleagues' posts are included each week. By clicking on the image, the html code for the page can be accessed to copy and paste into a WebCampus page.